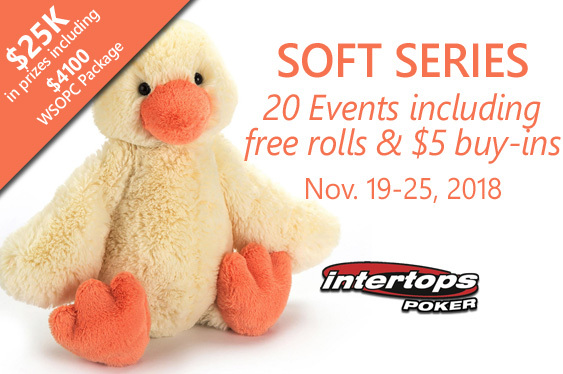 Intertops Poker is hosting its first SOFT Series – 20 poker tournaments designed especially for recreational and casual players, awarding a total of $24,850 in prize money. The series kicks off with two $500 free rolls on Monday and culminates in the Champions Tournament on November 25th where a $4100 prize package for the WSOPC in sunny St Maarten will be awarded. Intertops Poker is hosting its first SOFT Series – 20 poker tournaments designed especially for recreational and casual players. They'll award a total of $24,850 in prize money. The series kicks off with two $500 free rolls on Monday, November 19th and culminates in the Champions Tournament on November 25th. The winner of that event gets a $4100 prize package for the WSOPC in sunny St Maarten and will be on their way to the Caribbean in the spring! Register for SOFT Series events under the Tournaments tab in the poker software. All games are NL Texas Hold’em except for the 5 Pot Limit Omaha games. Unlimited re-buys and add-ons except where noted. All times are Eastern.